The blaze took place on Jan. 7, 1950, in the St. Elizabeth Women’s Psychiatric Building of the former Mercy Hospital, now the site of Genesis Medical Center’s west campus. The National Fire Protection Association (NFPA) reports that among healthcare facilities, it’s the third deadliest fire in U.S. history. Forty-one people died. Of those killed, 40 were mostly elderly mental patients, and one was an attendant. The worst healthcare facility fire in history was at the Cleveland Clinic in Ohio on May 15, 1929. It killed 125 people. 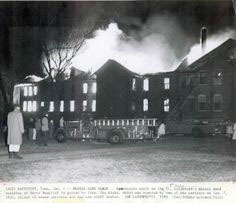 Second worst was a fire at St. Anthony Hospital in Effingham, Ill., on April 4, 1949. Counting patients and staff, 74 people died. A January 1950 NFPA report, volume 43, no. 3 of The Quarterly, detailed what happened that deadly January night in the St. Elizabeth building. The report goes into great detail describing the brick, wood joist building, which was a separate structure but administered as part of Mercy Hospital. It was a two-story building with much of the basement above ground. So, with its attic it appeared to be a four-story building. The NFPA says the fire was discovered at an undetermined time prior to 2:06 a.m.
“There was one outside fire escape but access to it was blocked by barred windows,” said the report. It said a patient undergoing periodic treatment ignited the curtains in her room on the first floor in protest over being locked in the room, which was not normal treatment for that patient. The fire quickly spread to the second floor and attic but also to the hallway when the patient broke the wired glass transom over her door and escaped through it and out the front entrance. There were two attendants in the building at the time of the fire. One was sleeping, and one was awake. The attendant who was awake died in the fire. The other one escaped from the second floor via a center stairway. • The locked doors and the mental condition of patients who wanted to stay in their rooms or, once out of the building, wanted to return. • The lack of a prearranged procedure for evacuation of the building in case of emergency. I’m sure there were many heroes at the fire that night, but one prominently recognized was a Davenport police patrolman named Richard Fee, 36. Though he did not want to talk about the fire in later years, Fee, who died Jan. 26, 2003, at the age of 89, wrote about his St. Elizabeth’s fire experience in a wire service article published soon after the fire. “I was one of the first to reach the hospital when we got the alarm,” Fee wrote. “Flames were shooting out of the windows on the second and third floors, and I could see more fire on the roof of the building. As the firemen put a ladder up, I grabbed an ax and climbed to the top of one of them. I chopped at the anchor bolts holding the bars across one of the windows. I thought those bars never would give way. “Finally the bars dropped to the ground, and I smashed the pane with the helve of the ax. I saw a sight I guess I never will forget. Silhouetted against the flames were a group of patients. They weren’t screaming and didn’t seem excited much. They just looked bewildered. Sort of like animals who had something new happening to them and didn’t know just what to do. Fee figured he had found about half a dozen patients and gotten them out the window. “I didn’t have time to keep count. Those flames were hot. I could feel them searing my uniform, and my skin as I ducked among them. I was a little afraid the floors might give way but didn’t have much chance to think about it. Fee wrote that when they got outside, the patients just stood round and looked at each other, “sort of unbelieving — as though they just couldn’t understand that anything like this could happen to them. There was very little screaming in the part of the building where I was, but I could hear terrible, terrible yells from other parts of the building. Thanks to improved building and fire codes, there are fewer chances of anyone seeing anything like that again. Copyright 2015 by Phil Roberts, Creative Enterprises. Submitted as a column to North Scott Press, Eldridge, Iowa. 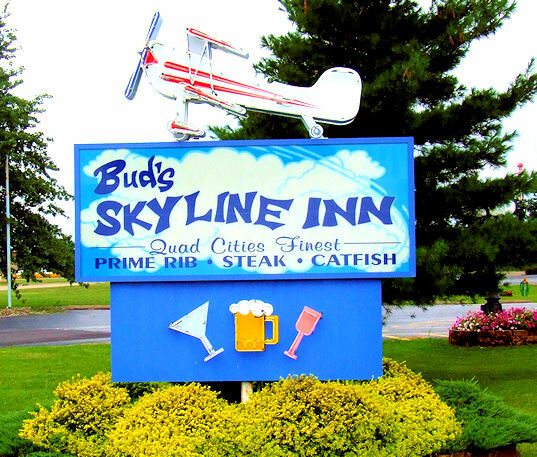 I will always remember two Quad-Cities landmarks that are no more. They are the long closed and recently demolished Dock restaurant on the Davenport levee, plagued over the years by floods and fires, and the Lodge Hotel & Conference Center, formerly Jumer’s Castle Lodge, in Bettendorf. It is also now closed. When I was a youngster, I remember eating lunch with my dad in the 1950s at the riverfront restaurant near the roller dam. 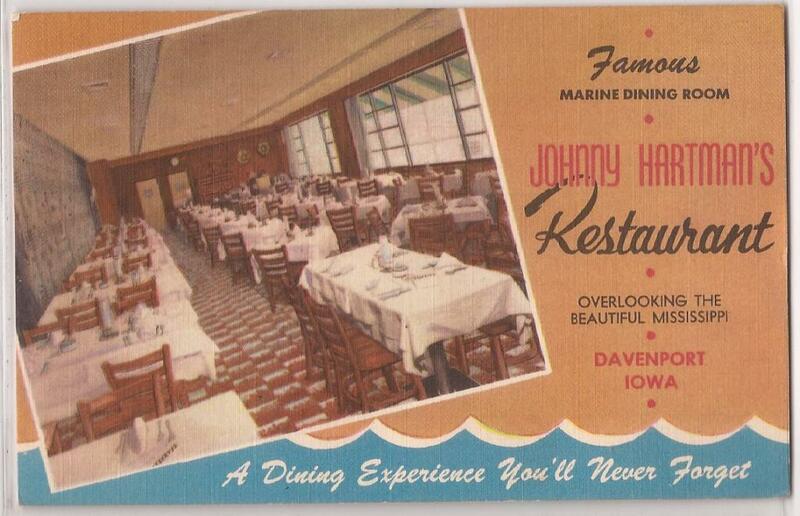 Then it was called Johnny Hartman’s (See the old postcard pictured above). Later it became the Dock, then the Rusty Pelican, then Pronger’s and, finally, the Dock again. What I remember most about that experience with my dad isn’t the meal. It was being allowed to reach into a “treasure chest” full of toys and trinkets— like you’d find in a Cracker Jack box — near the front door as we left. I was invited to choose an item. I no longer remember what treasure I selected, but I was thrilled at the time. What perhaps was my next visit to the building was in about 1966 when its ballroom area known as the Draught House was a popular teen hangout. A local band known as the Night People provided the music, singing songs made popular by the Rolling Stones and others. As a young married couple in the early 1970s, my wife Sherry and I would dine at the Dock on special occasions — when we could afford it. There was something magical about sitting at a white linen tablecloth-covered table near the picture window, watching Ol’ Man River flow by just feet away outside. We ate at the Dock on Monday, May 1, 1972. I remember that date because the next day my wife gave birth to premature twin daughters. We lost Alisa when she was 2 days old. But her sister, Andrea, survived, to be joined in later years by three brothers. The last time I ate at the Dock was likely Monday, June 27, 1977. I was the assistant personnel director for the 26-store Davenport Division of National Foods. I had lunch at the Dock with my boss, the personnel director, Pat Spurrier, after we had checked out the space formerly occupied by the Draught House for a future company presentation. We were about finished dining when we heard a large boom. At first we thought a train had derailed nearby, but what we had actually heard was an explosion at International Multifoods, just east of us on River Drive. I was affiliated on a part-time basis with the former KWNT Radio in Davenport and hurried to the scene. I phoned in some reports from a pay phone at a restaurant across the street from the blast. One was picked up and broadcast nationally by ABC Radio News. The former Jumer’s Castle Lodge, a beautiful German-style hotel, restaurant and bar, now closed and with an uncertain future, is another place I well remember. In the early 1970s, I supplemented our family income by working part-time as a security guard and private investigator. I started with Per Mar but two other local companies called, and I ended up working for all three of them at the same time. One of the security firms had been hired by Jumer’s as the building neared completion to protect antiques that had been moved into the building, and the guard was required to carry a gun. I agreed to work a few shifts and the owner of the security company obtained a gun permit for me. He told me to pick the gun up at his house before I went on duty. “But I don’t know how to use it,” I told him. So the first night I sat outside the front door with a holstered gun that I did not know how to use. At one point there was a noise that I traced to a garbage can. Looking inside, I saw a mouse crawling into and out of an empty pop can. In later years, Sherry and I celebrated special occasions with dinner and the occasional Sunday brunch at Jumer’s or The Lodge. I have missed the Dock for a long time, and now I will also miss The Lodge. Copyright 2015 by Phil Roberts, Creative Enterprises. This was submitted as a column to the North Scott Press, Eldridge, Iowa. I’m confused. (I know; that’s nothing new.) The daily paper today says gas prices are falling. But yesterday morning (Oct. 5), as I filled my car with gas at the Walcott (Iowa) Casey’s, the price for gas with alcohol was $2.19 per gallon. At the same time that I was filling my car with $2.19 per gallon gas, a staff member was changing the price for it on the sign to $2.25 per gallon. I then drove to north Davenport (Iowa) and made a point to look at the prices of every station I passed. Most were $2.19 per gallon and none were higher than that. Gas prices may be falling, but perhaps Walcott Casey’s did not get the memo.